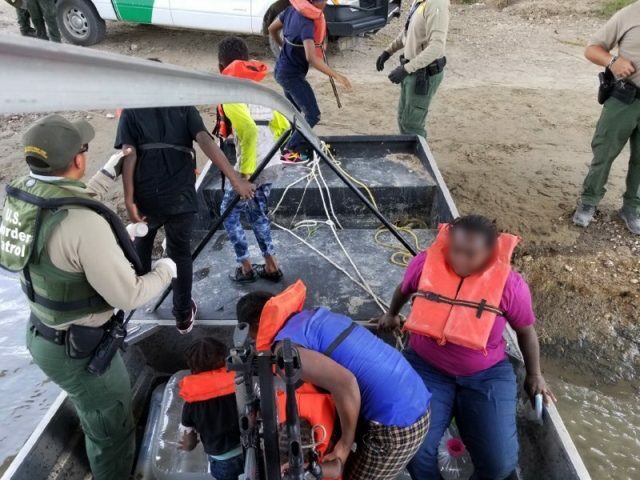 Border Patrol agents rescued a woman traveling with three children not her own after they became stranded in the middle of the Rio Grande River border with Mexico. Officials told Breitbart Texas the children traveling with the woman were unaccompanied minors. The woman was also crossing with another and her two children. Del Rio Sector Border Patrol agents battled strong currents and high water to rescue seven illegal immigrants left stranded in the middle of the Rio Grande River, Breitbart Texas reported. Agents assigned to the Eagle Pass Border Patrol station came across a group of illegal immigrants on June 12 who were abandoned on a small island in the middle of the Rio Grande River border with Mexico. They found two adults and five juveniles who became stranded, according to U.S. Customs and Border Protection (CBP). Border Patrol officials indicated the two women put the minors in dangerous conditions while attempting to cross the border illegally. Officials did not say if the group was traveling with a human smuggler at the time. Responding to an inquiry from Breitbart Texas, CBP officials confirmed that one of the adult women was traveling with her two children — ages one and three. “Also in the group was another adult female and three unaccompanied children,” the CBP statement reported. Del Rio Sector spokesman Dennis Smith confirmed to Breitbart Texas on Monday that the three minors were not the woman’s children by blood or legal guardianship. Border Patrol officials frequently told Breitbart Texas that they find adults traveling with unaccompanied minors who attempt to claim they are family members.